Do you want a profitable blog? If you are like many small business people you may have wondered what all the fuss is about with blogging. Blogging has become extremely popular over the last few years. This is because unlike regular webpages, which are coded in HTML/CSS, they require no special programming skills to update or modify. A blog once it is installed can be easily maintained by the average small business owner. This cuts down on web maintenance fees and website update headaches. Along with their cost-saving advantages, blogs are also a profitable way for a small business to increase sales, and build a strong connection to their customers. But in order to have a blog that does this it must first attract the attention of both search engines, for traffic, and readers for quality content. Key One — Consistently Update Your Content. This key centers on creating fresh content. By fresh content, I mean regular uploads of new posts, photographs or other content like audio or video files. Fresh content served several functions. Number one is that the readers of your blog can quickly become disinterested in your site, if they keep returning to the same a old stuff time after time. The second function that fresh content serves is the process of optimizing your site for the search engines. All search engines such as Google, use bits of software called “spiders” to search pages and index them for databases. Spiders have the capacity to recognize related words and terms and then using a secret formula determines what is the central topic on a particular webpage or blog. The more content you add to your site the more your readers will return and the better the search engines will understand what topic or subject matter, you are trying to communicate. Key Two — A Popular Blog Has Interactivity. People frequently come to blogs to participate with like-minded people or communities. By allowing your readers to comment, offer opinions in polls and answer questions from your or other readers, you are creating responsive readers. And responsive readers make very good customers. Once people are comfortable with you from reading your blog posts, they will also be more willing to trust your recommendations on various products and services. Key Three — Know Who Your Readers Are. By knowing who your online audience is you will be better able to write posts that interests them. 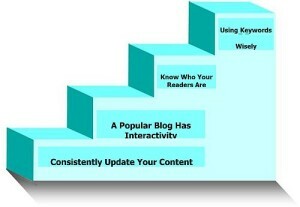 A good post in turn makes people want to spread the word about your blog to their friends and associates. A quick way to find out more about your audience is to conduct a simple survey. Often people will respond to requests for surveys from e-mails or from blog posts faster then they will from on-screen survey pop-ups that interrupt their reading. There are several free services online, which make producing a survey fairly painless. Or instead of a true, formal survey you can simply request your readers to comment on 3-5 questions you ask them in a blog post concerning their interests, backgrounds, and why they like reading your blog. Key Four — Using Keywords. Keywords are simply the words that people type into search engines such as Google, Bing, and others. In order to sell advertising, search engines turn around and take these search terms and use them as “keywords”. Keywords are sold to the highest bidder in advertising networks such as Google’s Adwords. It is this use of keywords that allow advertisers to place the appropriate and relevant ads on search page results or on related websites. In turn if you place these same keywords in the title or body of your blog posts, you are auto-magically, telling both your readers and the search engines about the core concepts inside the post. So how do you find keywords? Most blogs or websites offer statistics or “stats” application that let you see what keywords people used to find your blog via a search engine. Look at your more popular or most viewed posts and re-use any common keywords you might find. On the other hand, Google offers a free keyword tool to the public. By searching this keyword tool, you can determine what words your readers (i.e. customers) are search for online. While these four keys may seem simple, they are not easy. It requires a good bit of work, in order to make any website or blog profitable. But now that you have these tips you are closer to that goal than ever before.